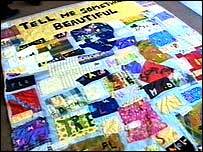 Artist Tracey Emin is refusing to allow a patchwork quilt she made with children to be sold by their school. Ecclesbourne Primary in Islington, north London, says it wants to auction the piece for £35,000 for an arts unit. But Ms Emin wants the return of the blanket made as part of an art project and warned she will not authenticate the piece, reducing its value. The school decided to sell the work as it could not afford the £4,000 needed to display it in a case. According to the White Cube gallery, the London art venue which represents Ms Emin, she is "extremely upset and depressed by the news". The gallery told the school in a letter: "Tracey is one of the country's leading contemporary artists and Ecclesbourne school should be proud to be in possession of such a historically valuable collaborative work ... but your actions suggest otherwise. "In the light of this, Tracey has requested that the blanket is collected from the school as soon as possible." But art teacher Chris Mooney told BBC London the school would put it in a showcase if Ms Emin would pay for it. "If we can't display then we should sell it. "The money would be really helpful to the school." Ms Emin went to the school in 2000 as part of a scheme in London called Art in Sacred Spaces. In the project children worked with 12 contemporary artists and their work was displayed in places of worship in a week-long exhibition. 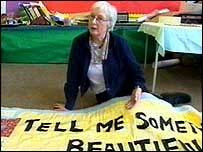 Taking as her theme the title "Tell me something beautiful", Ms Emin invited eight-year-olds to nominate their ideas of beauty and then to sew the keywords in felt letters on bright fabric squares. The resulting bold patchwork, featured words such as "tree", "sunrise", "dolphin" and "nan". "Without the artist's endorsement, the quilt could be worth nothing"